Hellblazer is cancelled with issue 300. 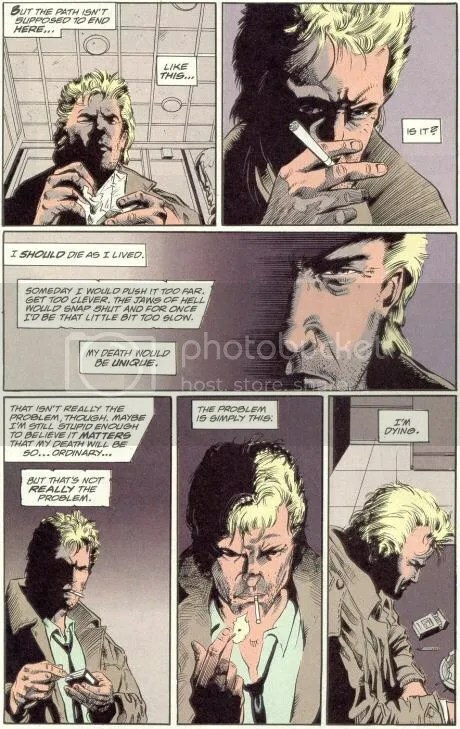 It strikes me that there are people reading this who weren’t born when Hellblazer was launched so here’s the short version; John Constantine is an amoral, massively troubled punk rocker turned magician who lives and works in London, getting into trouble with Heaven, Hell and everything in between. John isn’t nice, John isn’t brave, John is you or me with a well-defined survival instinct and magical ability. He’s the anti-hero’s anti-hero and for 25 years he’s sauntered along, causing trouble and making a name for himself. Throw a rock at any serious UK comics talent in the last twenty years and odds are they worked on Hellblazer at some point; Morrison? Check. Ellis? Check. Ennis? Check. Jenkins? Check. Moore? INVENTED him for his run on Swamp Thing. John has friends in high places, and he knows all the right people. Except it seems for people in editorial. The series, with dismal sales figures, has finally been cancelled and is set to be replaced by Constantine, a mainstream version of the character based on his appearances in Justice League Dark. I’m reliably informed that that’s vastly improved from the first arc, and frankly it needed to, so I’m cautiously optimistic. Nonetheless, I’ll miss Old John when he goes. That comic was the first thing I read that I knew I wasn’t old enough for and that illicit thrill, combined with the great plotting and uniquely British horror of the title, endeared it to me and many others, albeit, it seems not enough people. Dogbreath and Zarjaz are the perfect examples of small press comic fan work, each dedicated to Strontium Dog and 2000AD. They’ve produced amazing work and several of their contributors have gone on to work for 2000AD itself. They’re not quite a farm league, but they were and as far as I know still are a recognised and respected talent pool. -How would you pay printing cost? Go through a service like Magcloud or Lulu and that cost is eaten by the cover price. It puts the cover price up admittedly but it means no upfront costs. -How would you find creative teams? Ask Twitter. Look on sites like Digital Webbing. Post an open submission call. Start a fan page and see who joins it. In my experience there’s an operational ratio of three artists to every ten writers in small press comics. The trick isn’t to find one, it’s to find one that’s good and reliable. -What would the teams be paid? Nothing, other than the exposure they’d get through the project. Small press comics are always all about the calling card, about the last job you did and let’s face it, this is a hell of a last job. This is the question I’ve been trying to get answered for days. The closest I’ve come to an answer is this; surely you could get away with a single issue? I know there’s a Hellblazer fan web series some people are gleefully awaiting reaching DC’s radar, but surely a single issue fanzine for a dead book would fly under the radar? Even then if you were worried, donate any profits to charity. Good question. Not me, I don’t have the time or the contacts but there has got to be someone out there willing, surely? It’s a thankless task but take it from someone who knows there is nothing on Earth like holding a printed copy of a book you edited in your hands, nothing. And what if you decided to err on the side of caution? Easy. -The fact a Mummy’s scream is said to be heard in the old, abandoned Museum street Underground station. -The group of feral Londoners living in the Underground tunnels. -The countless reports of hauntings in and around the sites of Jack the Ripper’s murders. -The Bermondsey house which was bombarded with stones from no visible source for over eight hours. -Ann Boleyn’s execution barge making its way silently down the Thames. -The angel reported hovering over the Thames in 2006, near the London Eye. Sightings date back to the Great Fire of London. London is one of the largest cities in the world, a place soaked in history and story and myth. It’s one of the reasons why John Constantine ended up there and you can put together a great anthology just setting stories inside its boundaries. 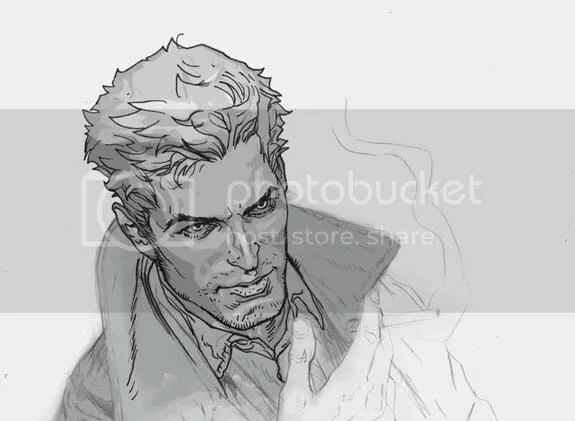 John Constantine is dying. It won’t last, as I say Constantine launches shortly, but 25 years of accumulated stories are about to end. That should be celebrated and celebrated in the medium he was born in. The only question left is; does anyone want to see the sly old dog out in the style he deserves?